Why choose a large breed puppy food? Below are snips from articles on this page. What exactly is food for large breed puppies? FACT: Different breeds of puppies have different nutritional requirements. Unfortunately, large breed puppies are predisposed to developmental orthopedic diseases (DOD) like osteochondritis dissecans and hip and elbow dysplasia. 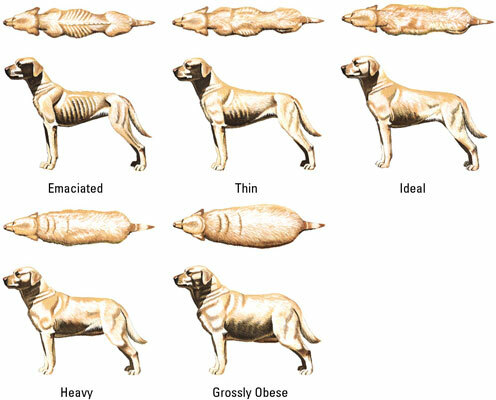 Breeding that includes human intervention (through feeding various food types) for increased size is dangerous as these puppies are forced into an unnaturally rapid rate of growth, which pushes the ability of the skeletal system to mature over its normal limits. So how important is feeding a large breed puppy food? The average golden retriever grows from 14 oz to over 65 lbs within one year – a 70 fold increase in size. Human beings take 18 years to accomplish the same thing. At the same time their joints are growing and being exposed to under- or over-nutrition, puppies are susceptible to higher weight stresses, compounding the challenges to normal development. 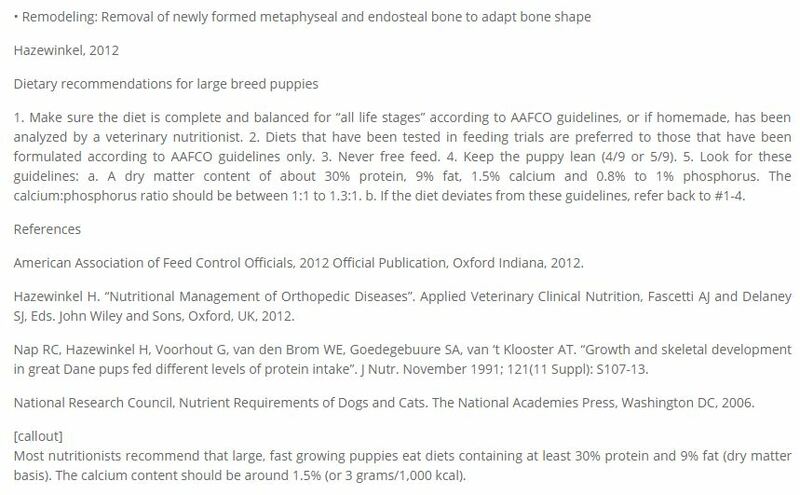 A common misconception found in many internet articles is the claim that dietary protein should be controlled in large breed puppies to prevent skeletal abnormalities. This theory was disproved some years ago (Nap, 1991). Most commercial puppy foods contain more protein than is thought necessary, but studies have shown that protein contents of 23% to 31% (dry matter) do not have a deleterious effect on growth. The most important factors in preventing developmental orthopedic disease (DOD) are rate of growth (which is proportional to the caloric intake) and dietary calcium level. 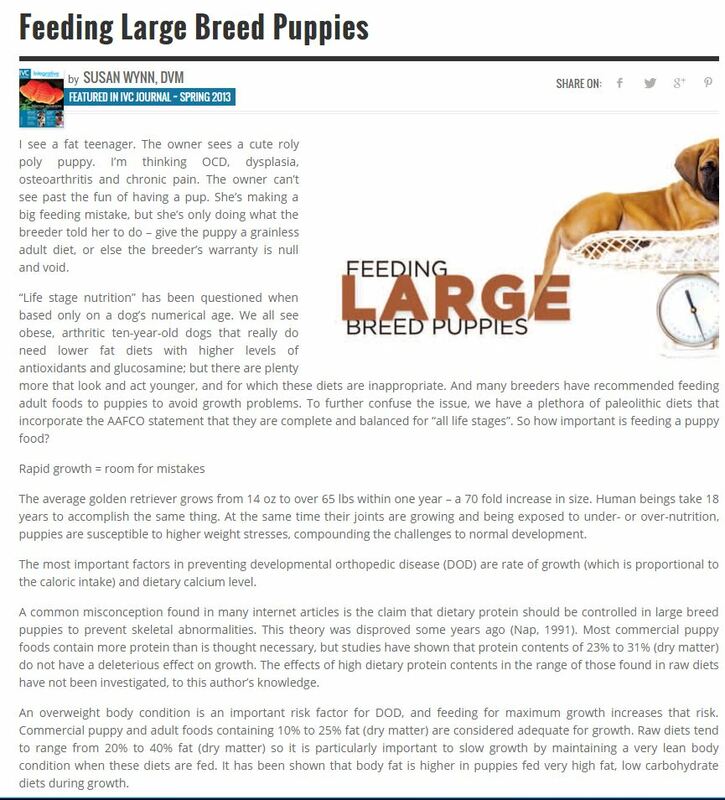 It is simple: Puppies need to mature naturally into adult stage and the number one goal with feeding larger breed puppy foods is to avoid overfeeding, which creates an imbalance of the puppy’s natural growth cycle. The main culprits when it comes to over-feeding and -nutrition are calories and minerals. By restricting a puppy’s caloric intake, we are able to slow down his rate of growth. The puppy will still get to his normal adult size; it just means it will take him a little longer to get there. Large breed food types achieve this restriction by containing reduced fat content and since fat content is the most calorie-dense category in puppy food, they have a lower calorie count. 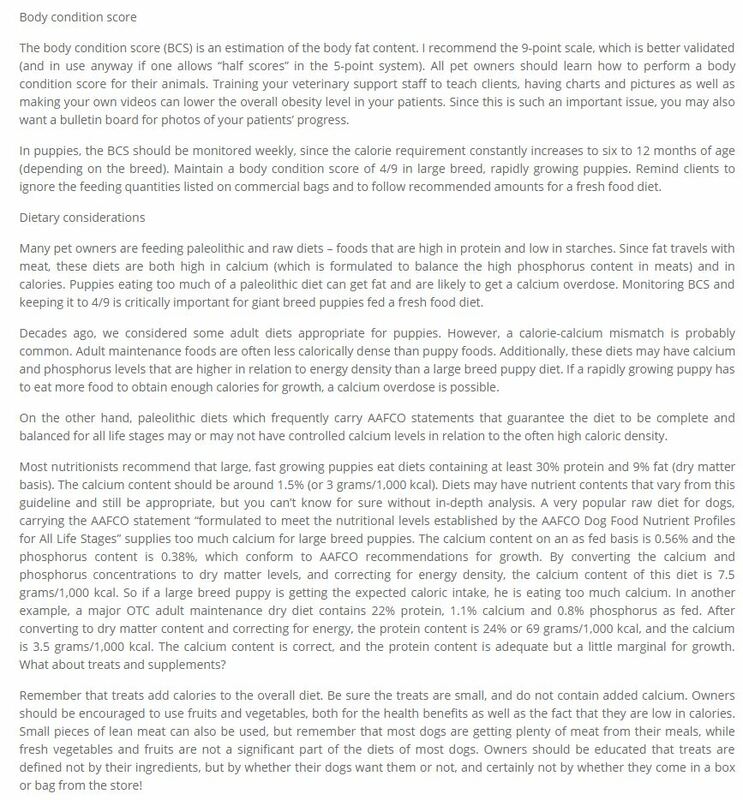 Although there are different beliefs between different nutritionists and animal health care providers as to what the right amount of fat content within puppy food is, it is generally known that foods designed for larger breed puppies have a fat content of between 8% and 12% on a dry matter basis while standard puppy foods often contain between 10% and 25% fat. However, all restrictions of the larger breed food types can be completely undone if the puppy eats too much of it at a time. Getting too much Calcium and having food types with a high Calcium to Phosphorus ratio also increases the puppy’s risk of developing DOD’s. 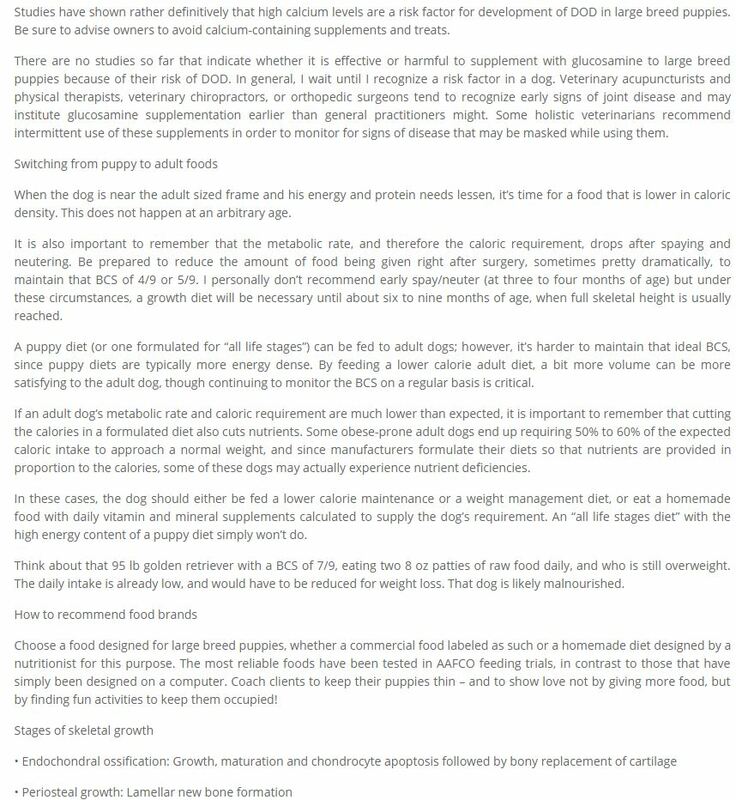 Foods for large breed puppies typically contain less Calcium than “normal” puppy food brands do and they also ensure that the Calcium to Phosphorus ratio is kept within reasonable limits. How Much to Feed a Large Breed Puppy? Several factors play a role in knowing how much to feed a puppy that include the puppy’s age, current weight, anticipated adult weight, the environment she’s in (including the climate), and her activity level. Puppies tend to eat much more for their weight than adult dogs do because of their increased amounts of calorie requirements according to their growth and energy consumption. Strangely enough, younger puppies tend to eat more than older puppies. Young puppies need to be fed three times a day whereas older puppies could be fed twice daily. Establishing and following a proper puppy feeding schedule is extremely important and the best advice with regards to the exact amount you should feed your puppy? As a general guideline use this chart as a visual. Don’t go by what the bag says, or you’ll have a fat puppy. Continually monitor your puppy’s physical condition and activity level. Puppy appetites go up and down throughout various growth stages and you’ll need to adjust the volume of food intake to ensure he is kept at an ideal weight throughout the growth process. Here’s one of the articles/sources I trust. Some portions are referenced above.